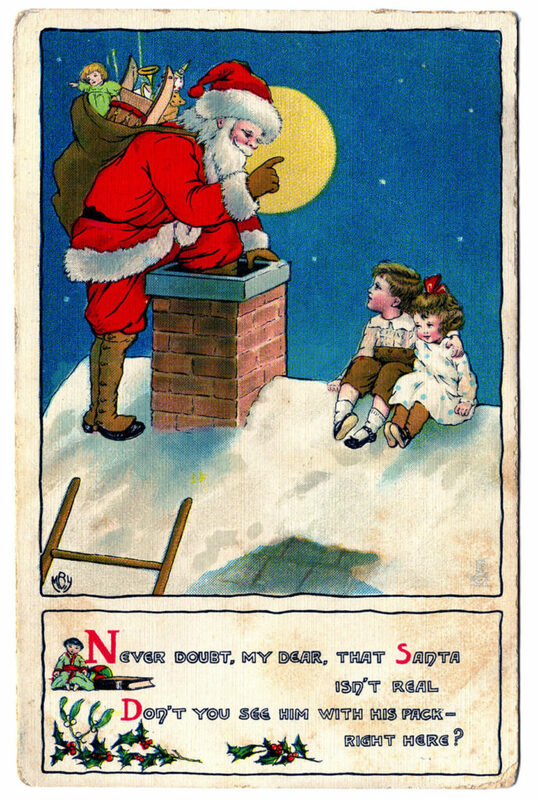 Today we have a delightful collection of vintage Santa Chimney Clipart images for you. This curated set of antique images begins with two colorful fun paintings of Santa on the roof. Then we have two charming images of Santa on the roof with children. How did they get on the roof with him? Hmmmm. 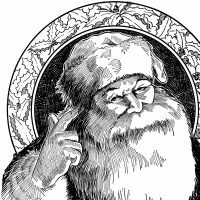 We finish with two black and white Santa Chimney Clipart images. I thought these images would be fun to use in your Holiday craft projects! The collection could be used in total to create an amazing Junk Journal or a Mixed Media Collage project. You might also incorporate some of all of them into a Christmas eve party theme. New to the site! Our first Santa Chimney Clipart image the look on Santa’s face tells it all. He loves all the children he visits and knows exactly the special gifts that each one of them wishes for. He has bright eyes over his curly beard as he steps into the chimney. . His double breasted red suit has dark fur trim. The courageous, strong, and loyal reindeer wait patiently in the background for the the next flight. What a beautiful sight! The “A Merry Christmas’ sentiment is framed with holly. 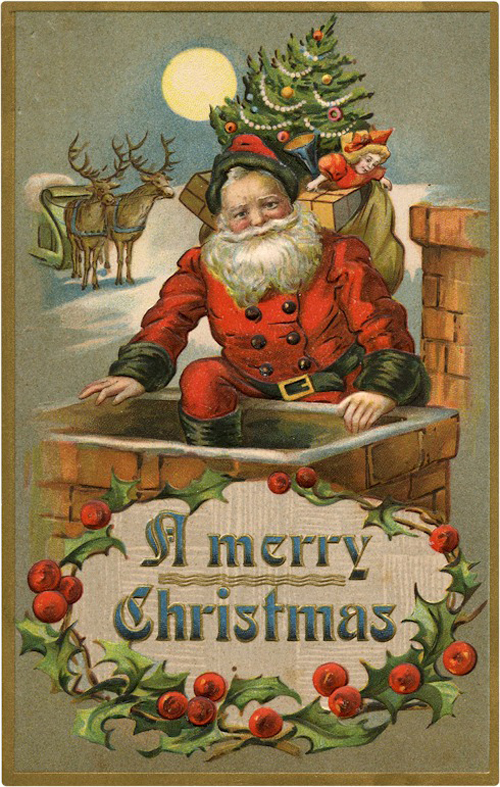 This is a gorgeous Vintage Santa Graphic (Circa 1907)! Santa has parked his Sleigh and Reindeer on the roof, and he’s heading down the Chimney with lots of toys! Love the colors on this one. 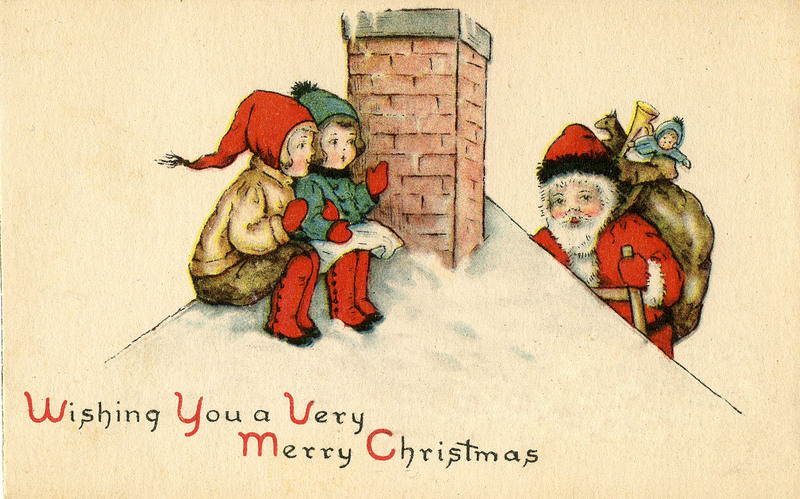 This is such a quaint Vintage Christmas Image of Santa Chimney Clipart! This one shows a dear little Santa on the roof with 2 cute Kids! This card is postmarked 1916 on the back. 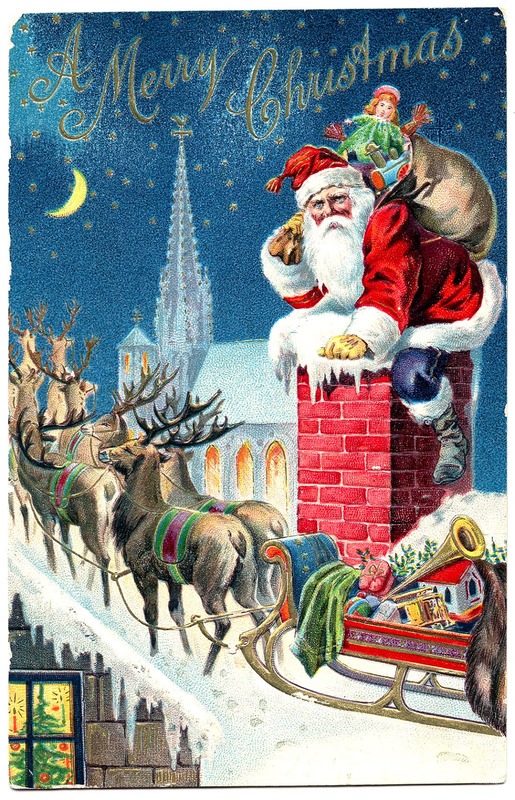 This is a sweet Antique Postcard (Circa 1914) showing a Cute Santa climbing down a Chimney. It looks like the darling Children have been waiting on the roof for him! I love the bright colors on this one! 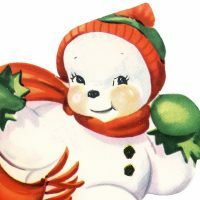 This is a Santa with Chimney Image! 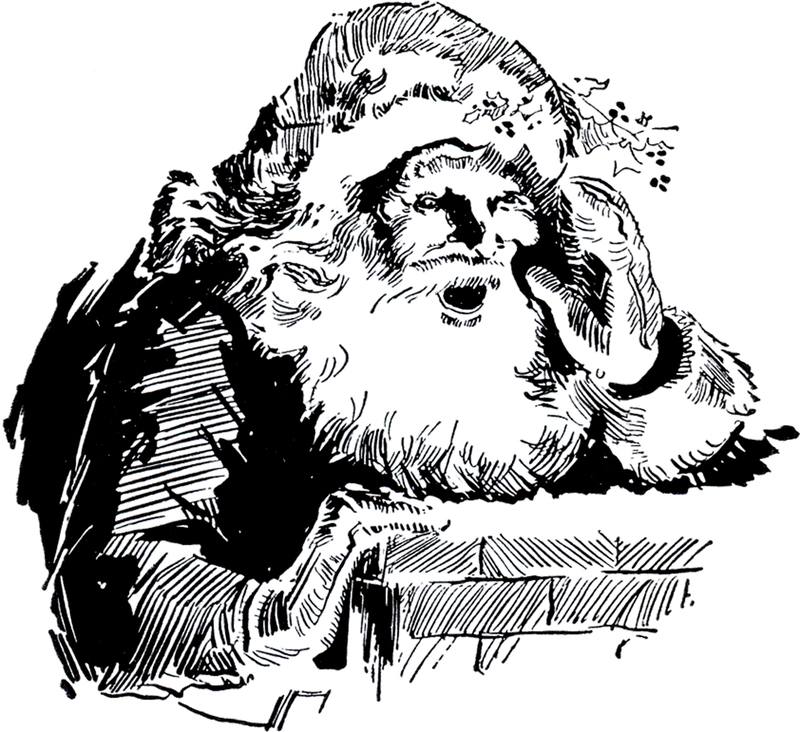 This is a black and white illustration of an Old World looking Santa, calling out into a brick Chimney. Maybe he wants to make sure there isn’t a fire before he climbs in! This one was scanned from a recent addition to my collection, a rare Circa 1941/1942 Printer’s Catalog. This was originally a pre 1910 Christmas rug ad. I have always had such a fondness for these graphic frames so, you can imagine how I was over the moon when I found this one with this amazing old fashioned Santa Clause.!!! 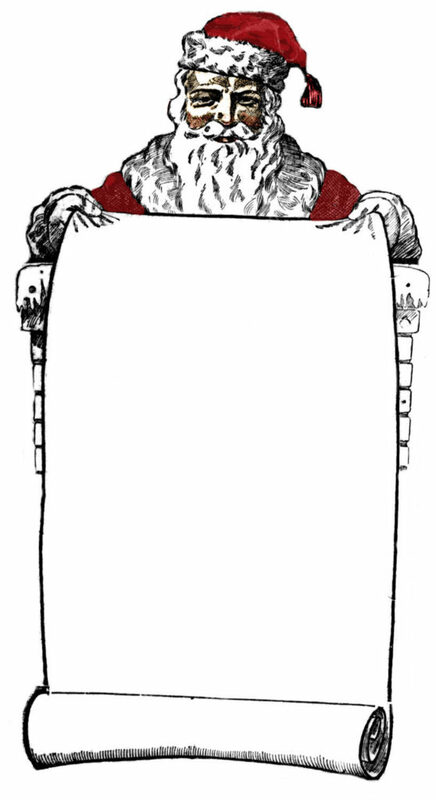 Santa is holding this scroll sign, that would be perfect for so many uses. You could print these out and have your kids use them as Christmas wish lists, or use it as a tag or label, print your holiday menu on it and set out for your guests, use it on your blog to announce your Holiday giveaways, or use it as a recipe card for your favorite holiday dish. I’m sure you can think of more, the possibilities are endless! I hope you like him as much as I do. I hope you enjoyed this curated collection of Santa Chimney Clipart. You might also like our Best Christmas Images Collection HERE. « 5 People with Christmas Tree Graphics! Really like this Santa. Thank you. These graphics are so amazing and so so appreciated. Thank you so so much!!! You don’t see these too often. Again, they are so pretty! Thanks so much Irene, so happy you enjoy them!